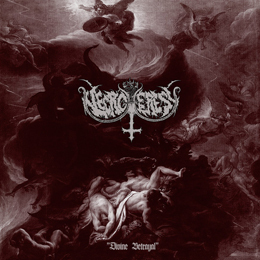 Slovakian outfit Necroheresy was formed in 2012 by former and current members of e.g. Karpathia, Aeon Winds, Krajiny Hmly, Silva Nigra or Concubia Nocte. To my knowledge, this is the band’s first official release, having a total running time of almost twenty minutes, for five tracks and an intro. The latter, also the title of the album, combines church balls and Gregorian chants with some background noise, and believe me: it sets the tone for quite some intense experience! With Falosny Prorok (meaning ‘false prophet’), the band shows its (rotten) teeth. Necroheresy surely, convincingly, proudly, pay tribute to the old school. I know, once again another old school revivalist, you might think. And yes, that’s correct: another band dwelling within the hyped spheres of early days revival. But what the frikadellekes: this is Glorious Tribute! What these sweet guys bring is a pure tribute to the Old Days, but with so much persuasion and craftsmanship at the same time. No, once again it totally lacks of originality, but it is full of highlights. Pieces like the somewhat punky Ohen Z Nebies (‘fire from the skies’) or the thrashing Slepy Mnich (‘blind monk’) show this band’s professionalism and joy-to-play, but this gets even further. Despite the short length (eighty minutes, including the intro and outro), there is so much pleasure for the listener, for this EP makes the (aged) fan proud being into the scene for two, three, and why not, fifteen decades. Fans of the Swedish, German and Dutch Old School scene will adore this material! That’s a promise!